Add Upward Extended Foot Pose (Urdhva Prasarita Padasana) to your practice for flat abs. As a yoga student, you can learn to build core strength without doing crunches. In a traditional sit-up, you would lift the head and shoulders off the floor to bring the elbows toward the knees. This "crunch" movement contracts the abdomen and primarily strengthens one set of muscles, the rectus abdominis muscles (the six-pack area), which run vertically from the front of the rib cage down to the top of the pelvis. When you work to develop core strength in yoga, the goal is not to isolate one part of the body, or just contract certain muscles. Instead, think of the core in relationship to everything else: your other muscles, your limbs, and even your mind. Urdhva Prasarita Padasana (Upward Extended Foot Pose) tones the entire abdominal region—the front, the sides, and the deeper transverse muscles that cross the sides of the torso—and it does so by lengthening and extending the whole body. The two ends of your body—the arms and legs—are actively pulling in opposite directions, like a tug of war, but the center, your core, becomes stable and still. Urdhva Prasarita Padasana is practiced with the back of the body supported by the floor, allowing the spine to fully elongate. And the pose gives you the strength to keep your spine long in an upright or standing position. With strong core muscles, you can sit and stand up tall, with a lift in the center of your body. Without core strength, the rib cage starts to sink toward the pelvis, and the shoulders and head can get pulled forward, causing tension in the upper back. Practicing Urdhva Prasarita Padasana can help relieve or prevent pain and tension in the entire back. Practice the pose in three phases. If you&apos;re already strong, you can spend more time in the final phase. Alternatively, you can stop at the early, less rigorous phases until you build more abdominal strength. Try to avoid tensing or gripping the neck, throat, and facial muscles, and instead keep them relaxed in each phase. In the first phase, with the knees bent (see Step 1), the arms stay at the sides of the body to support the back muscles until the core becomes stronger. The key is to lift the bent legs together without pressing the lower back to the floor; instead, rest the weight evenly on both sides of the pelvis. Raise and lower your legs (bringing the feet back to the floor) several times. Notice how the abdomen moves in and back toward the spine while the lumbar remains neutral, neither flattened nor overly arched. Let the work of holding your legs up come from your abdominal muscles, not the muscles of your lower back. In the next phase (see Step 2), practice holding the legs up perpendicular to the floor using abdominal strength. Keep both sides of the pelvis stable and keep the lower back neutral. If your legs swing toward your head, the lumbar spine will contract into the floor, and if they swing too far away from your head, the lumbar may get overly arched. With the legs reaching toward the ceiling, extend your arms overhead and press them into the floor. Firm the muscles around your knees and elbows. This resistance, or contraction, is what allows you to relax your hip flexors and groins. Continue to feel the abdomen moving toward the back. In the final phase, your arms and legs are pulling and reaching in opposite directions. Reach your arms and press them to the floor to allow the chest to expand. The chest counterbalances the weight of the legs as you lift and then lower them toward the floor. If you don&apos;t reach through your arms and legs, pressure can build in the lower back, thighs, and groin. Lower your legs as slowly as needed in order to keep your abdominals pulling in and your lower back stable. When you start practicing Urdhva Prasarita Padasana, you may not be able to lower the legs all the way with control. In that case, first practice the earlier phases of the pose. Keep practicing and remember to tug in both directions for a strong and steady core. 1. Lie on your back, with your legs fully extended along the floor. your body, and turn your palms to face the floor. 4. Lift your legs, bending from the hips to bring your thighs in toward your abdomen. Refine: Press your palms and outer shoulders into the floor to widen your chest. Lift both legs together to bring the thighs toward your abdomen. Allow the abdomen to be soft as it moves inward and toward the lumbar spine. Keep the weight of your outer hips on the floor and the sides of your torso long. Bring your attention toward the sacrum (the triangular bone at the base of the spine) and be sure that both sides of the sacrum also make contact with the floor. Finish: Squeeze in the outer thighs and hips to bring the legs together as one. Practice raising the thighs toward the abdomen with awareness and control. (Avoid using a swinging motion to create momentum to lift the thighs.) Raise and lower them several times, and with each repetition, gently and gradually engage the abdominal muscles without tensing other parts of the body like the neck, throat, face, or tongue. 2. Lie on your back, with your legs fully extended along the floor. 2. Stretch your arms alongside your body, with your palms facing down. 2. Bend your knees, bringing your heels toward the buttocks. 2. Bend your legs at the hips to bring your thighs toward your abdomen. 2. Extend your legs upward. 2. Firm your thighs and grip the muscles around the knees. 2. Extend your arms overhead, with your palms facing up. of your feet together. Press the front of your thighs toward the thigh bones and widen the backs of your legs. Now extend your arms overhead, along the floor, fully stretching from your waist to your armpits, to your elbows, to the backs of your hands and fingers. Press the backs of your arms to the floor and expand your chest. Finish: Elongate your entire torso by reaching your arms in one direction and pressing your thighs in the opposite direction. Allow the front of the abdomen to soften down. Stay for 20-30 seconds without tensing the neck or facial muscles. 2. Extend your arms overhead with your palms facing up. 3. Press the backs of your arms down and expand your chest. 4. Firm your thighs and grip the muscles around the knees. 5. Lift the legs up to 90 degrees. 6. Begin to lower them gradually toward the floor. Refine: To lift your legs, first reach with your arms from your waist to your fingertips and expand your chest completely. Spread your toes and stretch the bottoms of your feet. Reach out equally through your legs and lengthen them from the backs of your thighs to your heels. Keep extending in these opposite directions to raise the legs upward. Maintain the fullness in your chest to balance the weight of the legs. As you lift the legs, do not let the legs swing toward your face beyond 90 degrees. Finish: As you lower the legs, keep reaching strongly through your arms and legs. Maintain a gentle curve in your lumbar by lengthening the tailbone toward the heels and elongating your abdomen. To build strength, practice Steps 1, 2, and 3 in succession. The progression will teach you how the abdominal muscles are toned without creating unnecessary tension in your hips, groin, and quadriceps, or neck and facial muscles. Challenge yourself: Grasp the legs of a table for support and raise and lower your legs 10 times. Relax Your Abdomen: With your legs reaching up, loop a belt around your feet and hold the ends. Rest your elbows on the floor. Support Your Lower Back: Keep your arms by your sides, pressing into the floor, to support your back in all phases of the pose. Prep Your Hamstrings: Before you practice the pose, stretch your hamstrings for a few minutes in Legs-up-the-Wall Pose. Expand Your Chest: Place a folded blanket under your forearms and firmly press the backs of your arms down to open your chest. What does core strength really mean to a yoga student? It&apos;s more than having toned-looking abs. It&apos;s about learning to draw on your internal strength from a steady center. When something is truly strong at its core, it&apos;s unshakable. In Urdhva Prasarita Padasana, you reach with your limbs in opposite directions, but your center stays still and quiet. 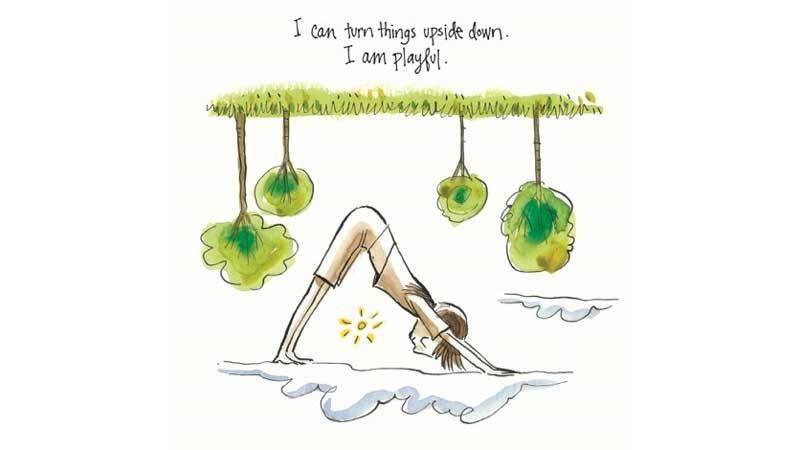 Finding a still center can help you navigate the highs and lows of life. The mind no longer gets pulled in all directions but instead has the ability to remain present and focused. You can learn to experience that stable center as the steadfast or unchanging element that resides within you. Watch: Fine-tune your practice of Urdhva Prasarita Padasana with an online video here.